I’m trying to catch up on some late summer and fall beers that I have had in the beer cabinet to review but never seemed to have the time. This is yet another one given to be by my friend Gene. It’s been so long I’m not sure if he got this while in Europe or bought this locally. Either way I can’t wait to try it. The beer pours a dark brown almost completely opaque with just a hint of ruby hues peeking through the thinnest portion of the glass. The pour also produce a fairly rich off white to light tan head. The nose is very intriguing with dark malt aromas with notes of toffee along with a very pleasant noble hop aroma. I can’t tell with the hops are but they remind me of the classic European beers. What a nice first sip; deceivingly light in body clean and refreshing with great malt flavors and a touch of those earthy hops on the finish. The experience starts out with a touch of caramel malt sweetness up front followed by a light almost refreshing mouthfeel in the middle of the sip. The back-end is very easy drinking with an effortless swallow. The finish is very nice with dark malt flavors with notes of toffee and a touch of caramel and coffee. The final aftertaste is of touch of lingering dark malts. This beer is refreshingly clean for a lager without that typical lager harshness. I am really enjoying this beer. This may be the best dark lager that I have had. As the beer warms I’m starting to pick up more on those noble hops on the finish. I suspect Hallertauer and Saaz but I’m not very good on my hops yet. A | Budweiser Budvar Czech Dark Lager is anything but your typical Budweiser. 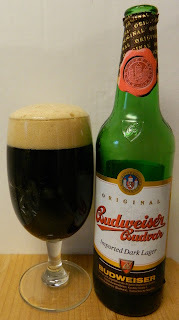 This Czech beer is rich with great dark roasted malt flavors with notes of toffee and a hint of chocolate with pleasant earthy hop flavors on the finish. This may be the best example of a Euro Dark Lager that I have had yet.